Roberta tells us all about her trip walking the Via Francigena in Tuscany and why it was a challenge she’ll never regret accepting! However, after a few hours, a sudden fear prevailed! For an unfit girl like me, the worry of not making it became my first thought and from that point onward, every day I started asking myself if I had made the right decision, wondering many times if I should give up! Luckily, I didn’t give up, otherwise what would I have missed! There is nothing like challenging yourself, leaving for the unknown and the discovery of new landscapes and beauty that you may only have imagined so far. So, there I am, on a plane to Pisa, on the way to our first stop, San Miniato. We spent our first night exploring the little medieval town and tasting the first glass of many of Tuscan wine. The following morning started with a nice big breakfast, an essential espresso, and off to what became the spectacular trip of a lifetime! My three work mates were such an important and fundamental part of this adventure…without them it wouldn’t have been the same! 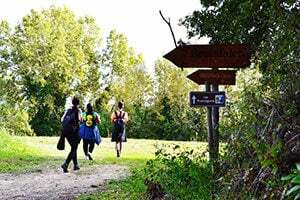 We spent all day ambling along the famous vineyards, in complete silence and meditation, interrupted only by the bird song and the steps of other pilgrims… two of them in particular became our friends along the way…this is also the magic of the Via Francigena! The following days went smoothly…To be honest, it was hilly but not particularly hard walking and perfect for anyone with a normal levels of fitness. However, the long walks and the hilltops that made our hiking a little bit tougher, were compensated by the beauty of the towns we reached everyday, one of my favourites being the enchanting medieval town of San Gimignano with its tall towers reaching into the sky and the delicious food that, together with the local wine, warmed our sore bodies, wet by the rain that caught us on one of the days. A perfect end to a perfect day! In conclusion, the only thing I can say is “Carpe diem” … You only have one life, and there is no time to regret what we could have done but haven’t because of fear. If you have any questions about walking the Via Francigena or to request a quote, contact our travel specialists. Roberta comes from the sunny south of Italy, Naples. Although very connected to her roots, she is a globetrotter and if she could she would wake up everyday in a different place, just like in her previous job on the cruise ship! She has visited many countries and will stop only when the world map comes to an end! Roberta studied Translation and Interpretation and has a Masters in Tourism management. When she moved to Dublin, she tried different jobs before returning to her first love…tourism!